Roger Tsien oversees a research lab at the University of California-San Diego from his home in Eugene, Oregon. A Terratrike Rover –his sole post-stroke transportation- proved too hard to pedal on the 600-foot climb and 20-degree gradient between his house and downtown Eugene. Also, it provided no protection from the weather (unlike San Diego, it rains in Eugene!). Ever the scientist, Roger had already devoured performance graphs from both Bionx and GoSwiss Drive before he visited our shop accompanied by his wife Wendy and their son Max. For the demo ride, RPDX mechanics built an HP Velotechnik Scorpion Plus with a High Seat and support arms. A Terracycle one-point fairing was added to keep him warm and dry during Oregon monsoons. And, to keep him moving up those 600 foot hills, we installed a GoSwiss Drive 500-watt hub motor. Shifting and hub motor controls were moved to the left side as were the Tektro twinned hydraulic disc brakes. 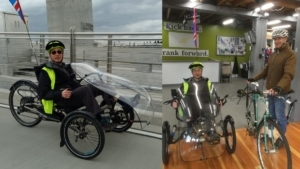 The video of the test ride shows Max – an accomplished distance cyclist – easily keeping pace on a Catrike 700 as Roger barreled up (and then down) the 500’ climb to Mt. Tabor. We regret to share that Roger Tsien passed away in 2016.